And Here We Go! : Call me obsessed, but . . . Call me obsessed, but . . . Being asked by Beth at Classical Conversations at Home to be apart of her new book club has been a BIG turning point in our homeschooling journey (thanks so much, Beth!). I have not been intentional about my educational choices or methods. "I believe parents want to take a moment to evaluate the purpose of education in order to move forward with conviction and purpose as they choose the type of schooling their children will receive." Oooh, 'Classical' sounds really smart - let's do it that way! Pretty sure that's what was going through my head when I signed up for Classical Conversations. I had certainly not evaluated the purpose of education, and I haven't been moving forward with conviction and purpose. Honestly, what really sold me on CC was one of the other mamas telling me they study the parts of the orchestra. Yeah, sadly that was it (easy sell, huh?). I'm so embarrassed to tell y'all that I really don't know what I'm doing. And, although I never claimed to have all the answers, I sometimes feel that by having a blog about our family and school stuff I'm supposed to be more educated about the whole 'classical model.' Well, I'm not. . .
Reading Teaching the Trivium by the Bluedorns has lit a FIRE in me to discover what the classical model is and if I really want go that route. After finishing the brick of a book in a few days, I read Leigh Bortins's Echo in Celebration, Dorothy Sayers's essay The Lost Tools of Learning, The Core, and Classical Christian Education Made Approachable. Now, I'm going back through all the books and writing down what each one has to say about the classical model and about the Trivium. I'm also making a list of what each book says to do at each stage (Grammar, Dialectic, Rhetoric). Oh, yes, now I'm learning. Yes, I can now say without a doubt that the classical model and CC are a perfect fit for our family. I feel confident that I have evaluated the purpose of education and can now move forward with conviction and purpose (as Leigh says). I will continue to learn and grow in my understanding of it all (because I absolutely do NOT know it all, not even close! ), but it's so satisfying to not feel like a poser in the CC blog world. Not that I was ever intentionally being fake, but I now see that I never really understood the classical model, and therefore I never truly understood what CC was all about. So, as my sweet Anna says, "I sorry, 'give me?" Okay, so why am I spilling my guts. After all, confession is good for the soul, but bad for the reputation. Well, I just figured that maybe some of you are kind of like me. Maybe you're in CC or you're thinking about educating your children classically, but you don't really know what that means or looks like in your home. So, I just want to encourage you to make the effort to dig deeper. Don't settle with just 'going with the flow,' even if you're already in a CC community. Do you know WHY the great folks at CC chose the memory work that they did? Do you know WHAT grammar-level kiddos are supposed to do and HOW? I sure didn't! I just did what everyone else was doing. So, if you're like me, I challenge you to discover WHY you're homeschooling classically and WHY you chose Classical Conversations to help you in your journey. If I can learn about it, you can, too! And having this purpose and conviction will now help me to persevere when the times get tough, which I know they will. So. . . It's short (around 100 pages I think), to the point, and it even has some nice charts that explain the Trivium and the entire Classical Conversations program. I learned a LOT from this little book! After you finish that one, I would suggest reading The Core, and read it intentionally, too, if you have younger children who are in the Foundations Program. Then, you can find encouragement in Leigh Bortins's Echo in Celebration. This is a free pdf book, but I took mine to Staples and had it bound so I could really get my hands on it and take notes. Finally, I would suggest you read Dorothy Sayers's essay The Lost Tools of Learning (free pdf). Personally, I was able to get more out of it after I understood the classical model and Trivium first. So, that's what I've been up to lately. I would love for you to join the CC at Home Book Club by reading along with us as we discover more about classical education this summer! And, I'd really love to hear your thoughts about all of this. Am I the only CC member who was in the dark about the classical model, which may be the case (red face)? In other news, are you going to Parent Practicum? Ours is next Monday through Wednesday, and I'm SO excited! I plan on posting pictures and all my thoughts about it, too, so if you can't make it to one this year you can see what goes on. Ooh, have to run! Have a great weekend, friends. And thanks for letting me be real with you! first of all, amazing that you got done that much reading in that little bit of time!! : ) love it! secondly, you're not alone! that's exactly why i started the book club! i think there are moms all across the spectrum -- ones who understand classical & are totally doing it at home, ones like me who have been growing in understanding since i first learned about CC, & ones who add on CC to what they already knew/understood about education w/o digging deeper. which is why it's so hard to do at home! i'm so excited about what i'm learning & the changes it'll make to our next year...maybe, even our summer! : ) as always, thanks for sharing!! 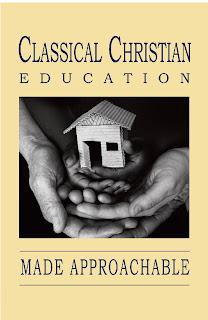 If you haven't read A Well Trained Mind, it's my Classical Education bible. I find The Core is basically a summary of it, but I'm into the details. I think you'll enjoy it. The author is a Christian, but it is not written from that point of view. It differs from teaching the Trivium on a few points...the first one that comes to mind is the age children should begin to read. I tend to lean more toward WTM. Thanks for the book recommendation...I haven't read that yet. Honestly, I've been kind of a bum concerning educational reading. Just too much on the "to do" list lately...I barely have time to read. But I just read the summary you posted most recently and it's awesome! I love summaries. : ) I need easy to understand things, too. So glad I've been able to connect with you and your blog...you've been SO helpful!